La Marche Des Rois is a carol describing the caravan of the magi, the “three kings,” to present gifts to the child born in Bethlehem. 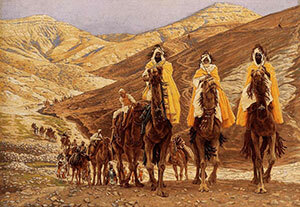 Unlike the typical imagery we get in more modern songs like “We Three Kings,” this carol describes the caravan of 30 pages, an honor guard, and armed men. THAT is more in keeping with how I imagine kings would have traveled. Not just 3 guys on camels. Also, rather than a mood of swaying back and forth to “star of wonder, star of night,” etc., we get more of an upbeat march with drums and lots of vocal harmony. The song is from The Gifts of Midwinter, by Ken and Lisa Theriot. Below are details about the song as they appear on the album liner notes. been incorporated back into the carol’s tune. Des gens armés dessus leurs juste-au-corps. C’est Melchior, Balthazar et Gaspard. Qu’ils ont porté à ce divin Enfant. De tres grand rei qu’anavon en viagi. Were Melchior, Balthazar, and Gaspard. By long roads unto the humble place. Which they have carried to the divine child.